This week’s Highlands real estate spotlight is on 885 Skylake Drive, a stunning home in a wonderful lakefront setting. Imagine enjoying your vacation in Highlands NC and enjoying views of a freshwater lake, golf course and mountains every day. This property offers that and so much more. 885 Skylake Drive is located in Highlands Falls Country Club and club membership is an option. This fantastic gated community has a great deal to offer its residents, including 24 hour gated security. This lovely 3 bedroom, 3 bath home is situated on a 1.2 acre lot. The interior of the home is bright and airy with floor to ceiling windows and high vaulted ceilings in every room. The spacious deck area offers views and the home is in immaculate condition. 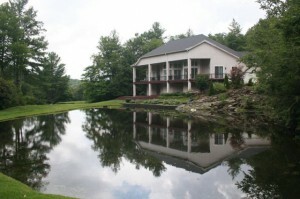 This unique Highlands property includes two lots, including the house and the lake. 24 Hr Gated Security. Contact me, Lynn Kimball, today to learn more about 885 Skylake Drive or any other real estate in Highlands currently listed for sale. My goal is to help my clients find the perfect mountain getaway, meeting their needs and their lifestyle. I know Highlands NC and I know Highlands real estate, let my knowledge and experience work to your advantage.